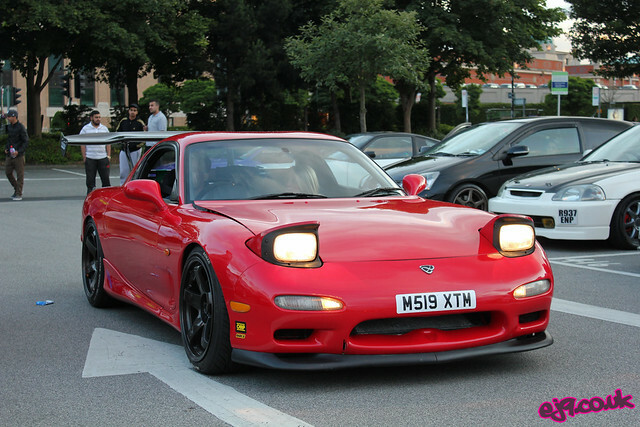 There is no denying it, the FB, FC, and FD generations of Rx-7 are all absolutely stunning to behold, with only the aforementioned rotary power plants putting many potential owners off. For those willing to ignore the naysayers though, the payload is fantastic. If you’ve ever driven or rode shotgun in an Rx-7 you’ll know that there’s nothing like them on the road; the attention I received in mine with the roof down was unreal (although to be honest most passers by were probably thinking “what a bellend!”) but also the driving experience as a whole is somewhat different to that of a comparatively normal car. The rotary power plant is unbelievably smooth and the power delivery is very different to that of a normal turbo powered car. 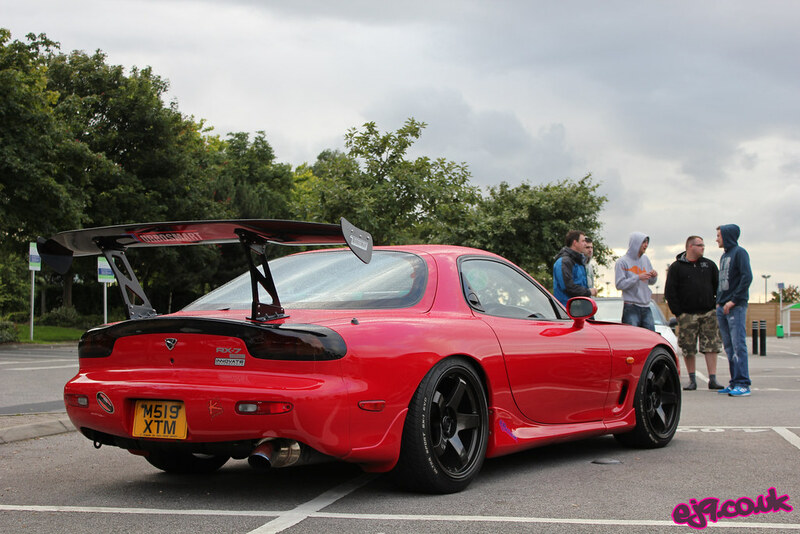 It all comes down to power and style, and Craig’s FD has both by the bucketload. 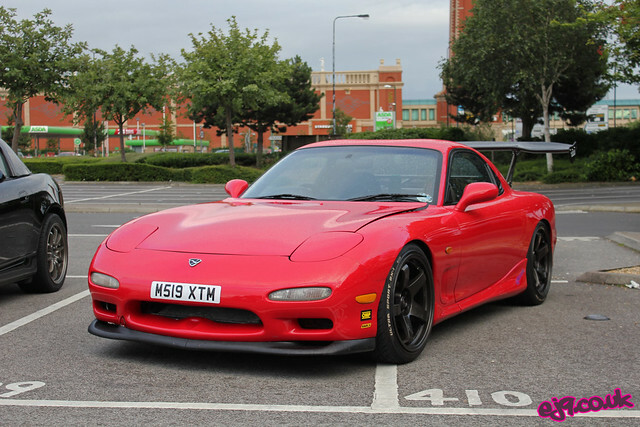 Starting with the basics, this ’94 Type RB import has been lowered on a set of HKS Drag coilovers. Filling the arches is a girthy set of 18×9.5 Rota GTRs, with the front pair wrapped in 235/40 rubber and the rears mated to rubber of 245/40 size, respectively. 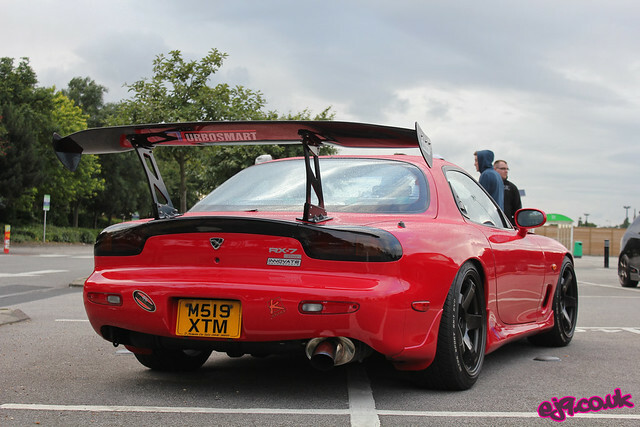 Visually speaking, that’s about it for this super sleek FD…that is, if you’ve somehow managed to miss the giant Japspeed rear wing! It’s definitely a marmite addition to the car but personally speaking I love it; I think the car has both the power and style to pull it off and pull it off well. I’ll save most of the details for the spec list at the end of the feature, but what you’re looking at is a Garrett T04R mated to a stock ported 13B located in the beautiful smoothed and wire tucked engine bay. The rotors have been machined to accept 3mm apex seals (of which Hurley items have been fitted) and the exhaust ports have also been polished. The V-mounted intercooler setup is also brilliantly executed and highlights just how little of the engine bay is actually filled with the comparatively tiny rotary unit. Controlling all of this is an APEX’i FC ECU, setup using FC Datalogit software and controlled by a Power FC mounted on the centre console. Once properly mapped, around 400bhp is expected at the flywheel. As you can see from the above picture, an engine setup like this doesn’t go unnoticed, even though we were at a Honda meet! Moving away from the engine it’s nice to be able to see some of the more subtle aesthetic modifications, the J’s Racing style tailpipe being one of them. The 3.5″ downpipe into a 3″ system was constructed by Craig himself at TGS (Top Gear Stockport) and sounds absolutely savage at full chat, a noise we were treated to as he disappeared off into the distance. 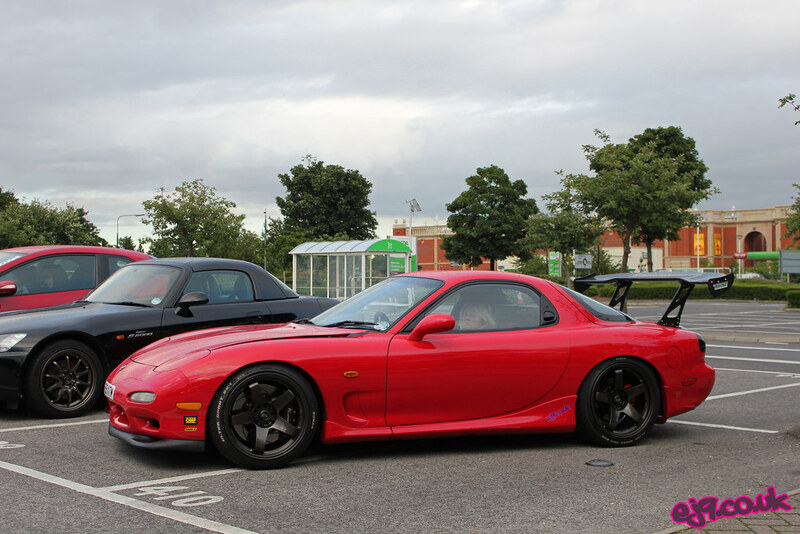 In my mind, the FD3S is probably one of the best looking cars to come out of Japan and it’s amazing to think that the design is now twenty years old. Thanks to that fickle rotary power plant though they are still relatively rare sights on the road, although maybe that’s for the best? Their exclusivity is just one of the things that make them so damn cool, and there is no denying that what Craig has created is cool, desirable and plain old awesome.